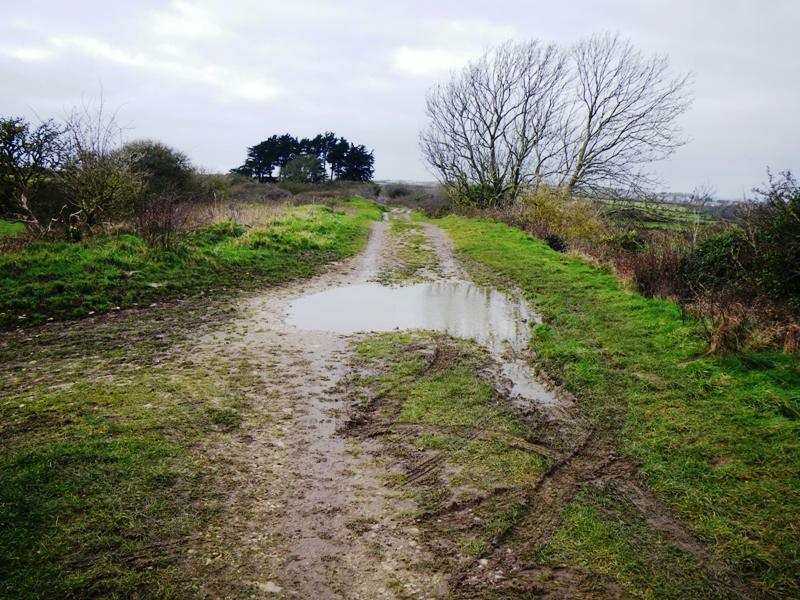 The Priest’s Way follows an ancient track taken by a local priest as he travelled back and forth between the churches in his care at Swanage and Worth Matravers. You can follow in the footsteps of the medieval priest as you walk along the ancient track. It passes between quarries and across open fields with spectacular views along the way. 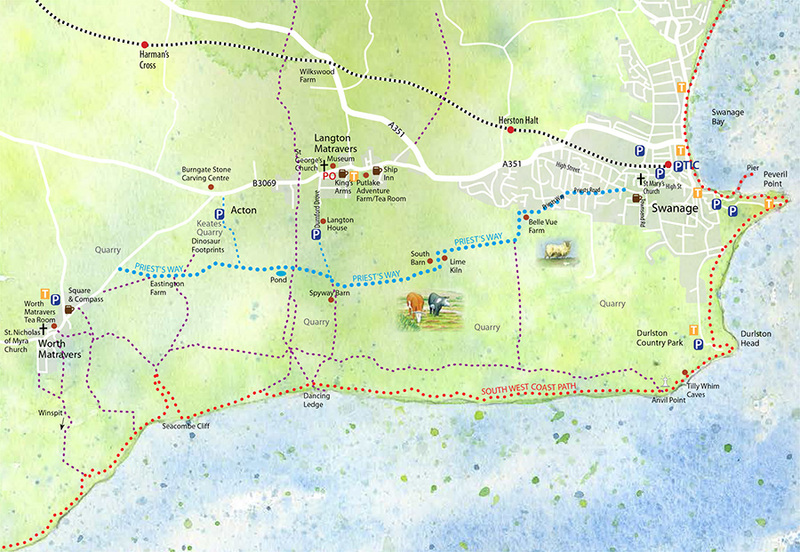 The walk finishes near one of Dorset’s most famous pubs, the Square & Compass. 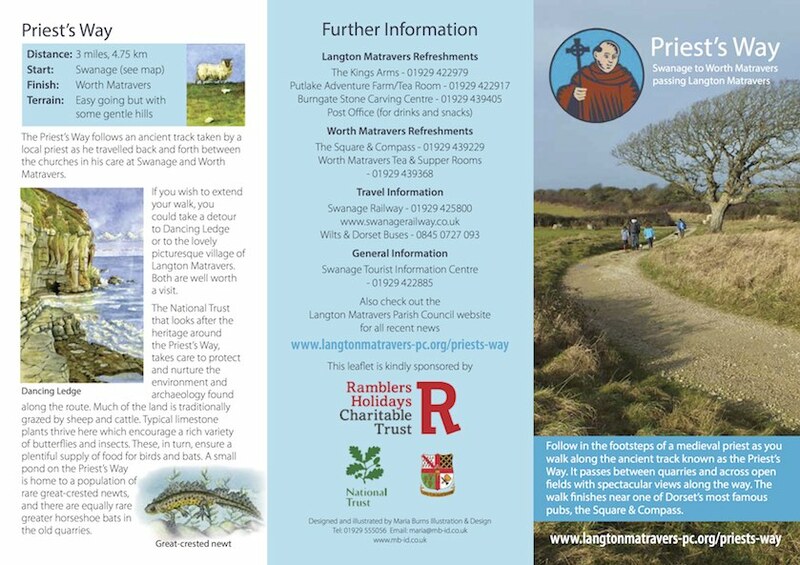 If you wish to extend your walk, you could take a detour to Dancing Ledge or visit us in Langton Matravers. Both are well worth a visit. The National Trust that looks after the heritage around the Priest’s Way, takes care to protect and nurture the environment and archaeology found along the route. Much of the land is traditionally grazed by sheep and cattle. Typical limestone plants thrive here which encourage a rich variety of butterflies and insects. These, in turn, ensure a plentiful supply of food for birds and bats. A small pond on the Priest’s Way is home to a population of rare great-crested newts, and there are equally rare greater horseshoe bats in the old quarries. Langton Matravers Museum was once a coach house. The museum provides a picture of the village history and how local stone has been quarried and used over time. Spyway Barn was used by smugglers to store contraband landed on the Purbeck coast. The smuggled goods were often moved inland to Langton Matravers church and stored in the roof. The barn is owned by the National Trust and has a display of local flora and fauna. Swanage Railway is a six mile heritage railway that follows the old Purbeck branch line from Swanage to Norden. It calls at Herston Halt, Harman’s Cross and Corfe Castle. Dancing Ledge is so called as at certain tides the ledge appears to dance as the waves wash over it. A swimming pool was blasted out of the rock in the early 20th century for use by the school boys from Durnford School in Langton Matravers (now closed). Square & Compass has been an inn since 1752 and has been in the same family for over 100 years. A museum in the pub houses fossils, dinosaur bones and local archaeological finds..
Limekilns were used to burn limestone to produce “quick lime”. This was spread on the land to reduce acidity and encourage plant growth. Mixed with water (slaked) it was used in mortar, as a whitewash for houses and as a disinfectant in cow stalls! Worth’s church is dedicated to St Nicholas of Myrna (the patron saint of seamen), it was started around 1180 and has a fine Romanesque chancel arch. From Worth the priest journeyed to “Swanwic” to minister to its fisherfolk – hence the Priest’s Way. Limestone quarries in Purbeck are important both geologically and economically. Famous for fossils and dinosaur footprints, Purbeck Limestone has been used since Roman times for building simple houses to great cathedrals. Why not try your hand at carving at Burngate Stone Carving Centre just to the north of the Priest’s Way? This song was written by Peter John Cooper, poet and playwright, who has lived in Purbeck for twenty years. The song was part of a piece called Purbeck Wheel performed in Langton Church on the retirement of Rector Robert Watton in 2003. The song describes the journey of a priest travelling from Worth to Swanage by donkey cart while reading his copy of Boethius Consolations.